About the Clear Cover: It is required for protecting the rebar against erosion and providing protection against fire. • Clear cover is mainly the actual distance from the bottom of fibre to the bottom level of the reinforcement. • It is also can be said that it is the distance between the concrete extreme fibre and bottom edge of a stirrup. The thickness of the concrete cover is depended upon the environmental conditions and type of structural member. The minimum thickness of reinforcement cover shall be obtained from the relevant cod of practice. The clear cover should be gaped in 40mm. 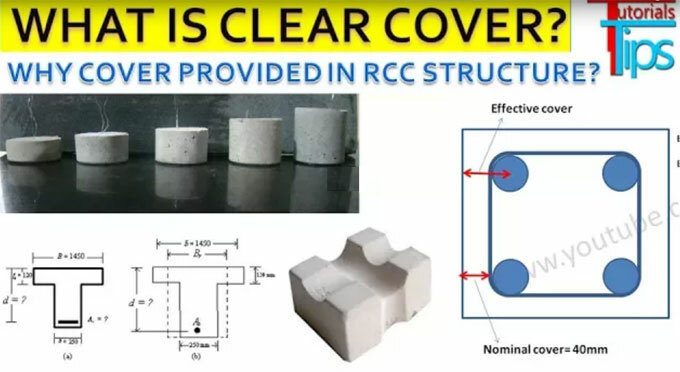 About Nominal Cover: It is defined as the concrete cover for its endurance which is maximum 50mm and defined in BS 8110 and AASHTO coarse of the construction cover in the case of over 50mm. • According to this IS Code 456:2000 and section 26.4.1, Nominal cover is mainly the depth design of concrete cover for all the steel reinforcements included links or stirrups. This dimension is used in the design and indicated in the drawings. • It should be the same as the diameter of the bar. • Nominal cover indicates a clear distance between face of concrete and face of outer rebar. • So Nominal Cover is less than Effective cover. • Generally it indicates the distance between the bottom of fibre of the beam to the center of reinforcement. • According to IS Code 456:2000, effective cover is given as- Effective cover = Clear Cover + Dia of Stirrups/links + 05* Dia of main reinforcement bars= 60mm. • It gives protection to the reinforcement from erosion. • Also gives fire protection to reinforcement. • Provides satisfactory fixed depth for making the reinforcement developed the essential stress.